Biodynamic certification, which is a step above organic, is the topic of today's discussion with Elizabeth Candelario, managing director for Demeter,1 a global Biodynamic certification agency. Candelario spent most of her career in the wine industry. While she was working as a marketing director for a winery in Sonoma County, the winery decided to transition from conventional to Biodynamic farming, which is how her interest in Biodynamics began. That experience — I not only witnessed the transformation of the estate, but I also witnessed a transformation in the people we were working with — was, for me, emerging between my career [in] the wine industry and my interest in social mission … I joined Demeter about almost 10 years ago." Organic is well-known in the U.S. market. Biodynamic is a fairly unknown concept, although its history spans back nearly nine decades. Biodynamic farming is a spiritual-ethical-ecological approach to agriculture initially developed by Austrian scholar Rudolf Steiner,2 Ph.D. (1861-1925). After World War I, chemical companies got very crafty repurposing nitrogen that had been used to make bombs as fertilizer, and nerve gas as synthetic pesticides. They had stockpiles of these chemicals and realized they had application on farms. This was around the time of the industrialization of the manufacturing model. The idea was that you wanted to produce the highest output at the lowest cost. It's not surprising that that kind of industrial view also influenced the way people started thinking about their farms. This idea of importing things from the outside, these natural resources, to increase production really mirrored that industrial model. But what was happening was that farmers were really beginning to notice that their seeds weren't germinating. Their animals weren't as healthy. The food wasn't as good. Because of that, they approached Steiner and asked him for his perspective on what was happening on their farms. He answered them in what is now referred to as 'The Agriculture Course or The Foundations for a Renewal of Agriculture' — a series of lectures he delivered." Steiner's view was as simple as it was revolutionary. He said, "You need to stop thinking of your farms as factories and envision them as living organisms — self-contained, self-sustaining, following the cycles of nature, and able to create their own health and vitality out of the living dynamics of the farm." Seventeen years later, Lord Northbourne coined the term "organic" based on Steiner's view of the farm as an organism. So, Biodynamic is really the origin of organic farming. Both focus on bringing life back to the soil and avoiding the decimation of the topsoil with synthetic fertilizers, which are toxic to microbial life. Demeter was started by a small number of farmers who attended Steiner's agriculture course. "They decided that what he had talked about was so important that they wanted to codify it in an agricultural standard," Candelario says. To ensure the standard would maintain its integrity in the marketplace, they decided to develop a strict certification program. Demeter was formed in 1928 in Germany and remains the oldest ecological certification organization in the world. Even back then, they had a formal certification process and a certification label, Candelario explains. While largely unknown in the U.S., Demeter is well-recognized within Central Europe. In Germany, 10 percent of the organic farmland is Biodynamic. There are even Demeter stores. I've fully embraced the Biodynamic concept and am currently in the process of converting the Mercola line of products from organic to Biodynamic certified and locating sources of raw materials to do that. Many are still not available within the U.S., but we're in the slow process of conversion. One of the Biodynamic products we'll release this fall comes from an Egyptian farm called SEKEM. "SEKEM just celebrated their 40th anniversary and their commitment to social mission is incredible," Candelario notes. "Because of the values implicit in Biodynamic agriculture, you see lots of examples of projects that have a huge social mission component." What's happening with the burgeoning interest in organic, which is a really good thing, is there's a lot of pressure on that standard, so you have products coming into the market that do the minimum of what is required, sitting right next to another product that's also labeled organic that does much more. In organic, a 10,000-acre conventional farm that does not use prohibited materials on 1,000 of its acres can get organic certification for those 1,000 acres. To qualify for Biodynamic certification, the entire farm must meet the standard, as the whole farm is viewed as an integrated living organism. Ten percent of that farmland must also be set aside for cultivation of biodiversity. This can be accomplished by leaving natural oak groves or waterways, or it could be created through insectaries and hedgerows. They answer that from a biodynamic toolbox, which may be green manures, composting, cover cropping and incorporating animals. The mindset is quite different. There are eight Biodynamic preparations. They're made from materials a farmer can find on the farm. They're used as compost amendments, foliar sprays and soil amendments. In organic, there's just one processing standard for all products. In Biodynamic, there are 16 processing standards. The intention is to allow the integrity of the agricultural ingredients to define the finished product, so you have high content of Biodynamic ingredients with minimal processing. It's a real foodie standard." Having animals integrated on the farm is a core principle of Biodynamic farming, but it doesn't end there. Great focus is also placed on animal welfare. While it's possible to gain Biodynamic certification for a farm that does not raise livestock, it's actually quite difficult to achieve optimal soil health without the integration of herbivores. They're really an integral part of a self-sustaining system. The certification process itself is very similar to organic. There is a base standard that needs to be met, regardless of size (and there is no size limitation). A farm or brand that wants to get a product certified submits an application. There is an inspection of the farm or the processing facility to ensure that the standard is met, and each farm or facility is re-inspected on an annual basis. The certification cost is also very similar to organic, ranging from $250 to $750. Annual inspection costs are minimized to the extent that it's possible by pooling inspections in one geographic area, allowing members to share the cost of an inspector. A catch-22 preventing Biodynamic from spreading faster is the shortage of certified products in the national marketplace. Most Demeter members are small family farms that only sell locally or regionally. "We realized we really needed to focus on getting some national brands to get products in the market so that we could use those products to educate consumers," Candelario says. Five years ago, Demeter started working with Whole Foods to select companies and brands whose values aligned with Biodynamic. It's a wonderful story because we now have 25, some of the leading national brands — soon to be joined by you as well — like Lundberg Family Farms, Lakewood Juice, The Republic of Tea, that have worked really hard and invested a lot to bring these products into the market. I would say the supply chain understands Biodynamic — the brands we've talked to, the retailers and other important players. But we're just on the verge of really doing the consumer education that we need to do." The key, and the intention of this interview, is to help you understand and recognize the importance of the Demeter certification label. That's really going to be the new platinum standard for high-quality, nutrient-dense food. While many Biodynamic ingredients must currently be sourced overseas, from communities like SEKEM in Egypt, the goal is to grow most of these ingredients right here in the U.S. for American-based brands. As noted by Candelario, the vision of Demeter is to heal the planet through agriculture, and we can do that by transitioning farming from conventional to organic and, ultimately, to Biodynamic. At present, the marketplace is being used to drive the adoption of Biodynamics on the farm, which is why it's so important for consumers to understand its principles, its benefits and to start asking for certified products. Demand is ultimately what drives change the fastest. In the case of Biodynamic, there are many reasons to support it. Foodists and those seeking optimal health will want it because it's a mark of superior quality and nutrition. Animal rights activists would be wise to support it as it places strong emphasis on animal welfare. Environmentalists will want it because of its healing impact on the Earth and normalizing effect on weather. "Paul Hawkin just wrote a book called 'Drawdown: The Most Comprehensive Plan Ever Proposed to Reverse Global Warming.' I really recommend it. In that book, he talks about how, in order to address climate change, we need to do two things. We need to address emissions. That is the burning of fossil fuels, the agricultural activities that actually release carbon into the air. The other half of the equation is we have to sequester carbon. We have to pull that excess carbon that's in the air back down and into the soil. Guess what happens when we pull carbon out of the air? It happens every day when the sun is shining. That's what photosynthesis does. It takes that carbon from the air and pushes it down into the soil. Not only are we sequestering carbon, we're making more healthy and nutritious food. In conventional [farming], sequestering carbon doesn't happen because conventional fertilizers stop that process where the plant is basically rewarded by the microbiota in the soil to pull that carbon out of the air. Synthetic fertilizers kill the microbiota in the soil. You don't have that carbon drawdown that you're looking for in conventional agriculture. 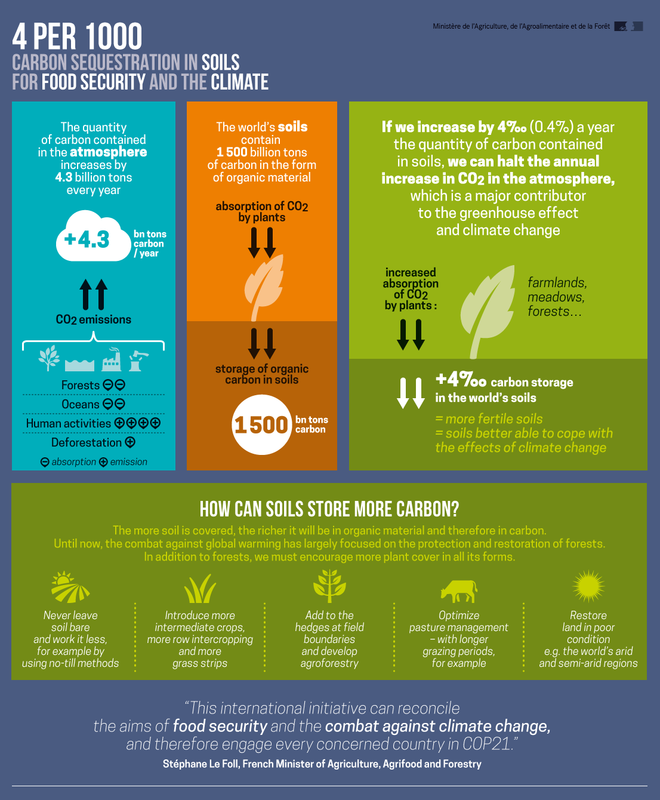 By definition, the more carbon you put in the soil, the more you're building a resilient soil. You're building a water conservative soil. You're building the potential to have incredibly healthy food." Measuring the organic content of soil is an easy way to assess soil health. Most conventional farms have an organic content below 2 percent. Virgin Midwestern prairie used to be 7 to 8 percent. Good soil has a deep black color, because carbon is black; it's rich and actually smells good. As noted by Candelario, a French initiative called the 4 Per 1,000 Initiative3 found that if we were to increase the carbon (the organic matter) in all agricultural land around the world by a mere 0.4 percent per year, the annual increase of CO2 in the atmosphere would be halted, because so much carbon would be drawn from the atmosphere. One facet of Biodynamic farming that might raise a few eyebrows is Steiner's soil amendments, some of which may sound fairly mystical at first. For example, one involves packing dung into a cow's horn that is then buried during a specific moon phase. "You can understand the preparations on a very practical level," Candelario says. "There is preparation 500, which is taking cow manure, putting it in a cow horn and burying it over the winter. There is preparation 501, which is taking silica, putting that in a cow horn and burying it over the summer. And then preparation 502 through 508, which are basically herbs — chamomile and valerian — those are used as compost amendment. [The] analogy I like to use is to think about a sourdough starter … It's a catalyst. And when you think about the idea of the farmer not being dependent on chemicals … and saying, 'How can I affect the fertility of my farm, the health of my compost pile, just from the materials I can find on my farm?' These materials were things that farmers already had on their farms. [Let's] talk about the 500 — First of all, putting it under the ground in the winter creates a constant temperature. It's the refrigerator where that cow manure can age. When you pull it up and you pull that out on the counter, it smells like chocolate. It's this beautiful material. It's put in water. It's dynamitized by creating a vortex; really stirring it, and then it's spread on the soil. It's sprayed as a tea. [You use] one cow horn's worth of manure per acre. We have research on our website that shows increased microbial life in the soil based on that. That's really not surprising when you think about it. The silica is used as a foliar spray." As organic standards are becoming increasingly watered down, there's an intensifying need for a more robust standard that cannot easily be bastardized. The USDA Organic label simply does not represent regenerative agriculture, and it's important to realize this. Many organic farms are not even using cover crops, let alone integrating holistic herd management. Biodynamic certification fills this need, and really surpasses even the most stringent organic standards ever devised. Again, key features of Biodynamic are the facts that the entire farm must qualify; it must operate as a self-sustaining whole; a portion of the land must be set aside for biodiversity; and animal welfare is addressed. I am actually in the process of converting the vacant lot next to my home to become certified Biodynamic. For more details, please see Demeter-USA.org. You'll find the standards listed in the "For Farmers" section. The website also provides a directory of certified farms and brands. This directory can also be found on BiodynamicFood.org. Demeter's U.S.-based sister organization, the Biodynamic Association, provides a lot of educational material as well, including an interactive Biodynamic webinar series, video and audio lectures and a quarterly Biodynamics Journal. There's also an international Biodynamic Association. I really think there's a clarion call right now, especially for the natural food industry, to focus on regenerative and Biodynamic agriculture. Because at the end of the day, Biodynamic farms are uniquely suited to address carbon sequestration in a way that other industries are not. The good news is that consumers have tremendous power when it comes to driving this change. Every time you shop for food, you're voting for one agricultural system or another, so make deliberate, intentional choices. Previous Article How Long Should You Wash Your Hands?